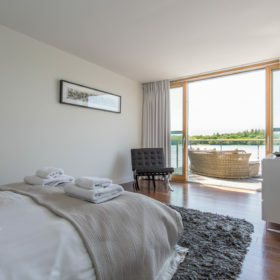 Among the spindly oaks, the Lakes by Yoo glitters with stardust, but you might prefer Lechlade Lodge’s 16-metre sun terrace for a barbie, the floor-to-ceiling glass sliding doors that merge indoor and outdoor living, the log fires, Sky TV and luxury en-suite bedrooms. 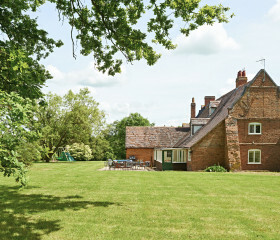 Become one of the privileged at England’s answer to The Hamptons or New York’s Sag Harbour. 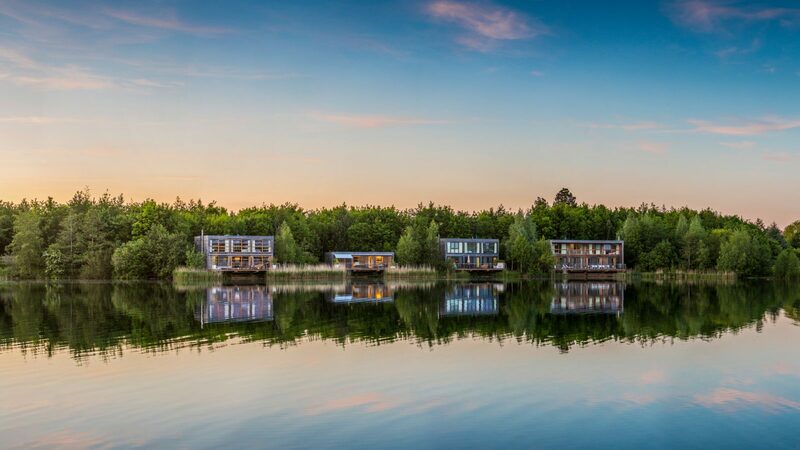 You’ll find Lechlade Lodge, resplendent in Russian larch, staring through its tall glass frontage at Longdoles Lake. The stardust at The Lakes by Yoo glitters, but it might not be the main reason you stay here. 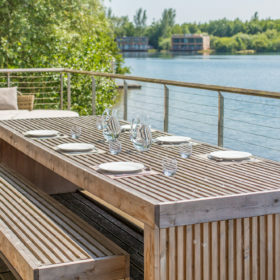 You might be attracted by Lechlade Lodge’s long sun terrace, the floor-to-ceiling glass sliding doors that merge indoor and outdoor living, or the chance to paddle across to the clubhouse in your kayak. 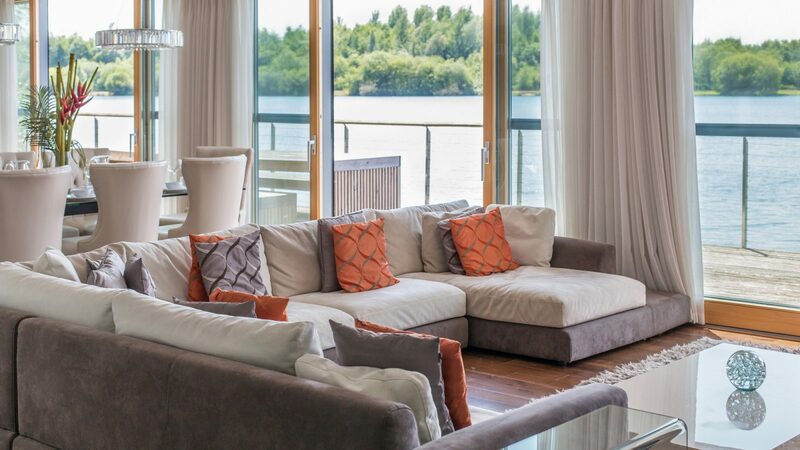 Sitting in the open-plan living area, among the smart monochrome and the soft neutrals, you could be aboard an upmarket boat. There’s a log fire to light, while you tune in to Sky TV over a Nespresso. Out on the 16-metre terrace, spark up the barbie as the ten-seat table, lounge chairs and loveseat help you laze around. 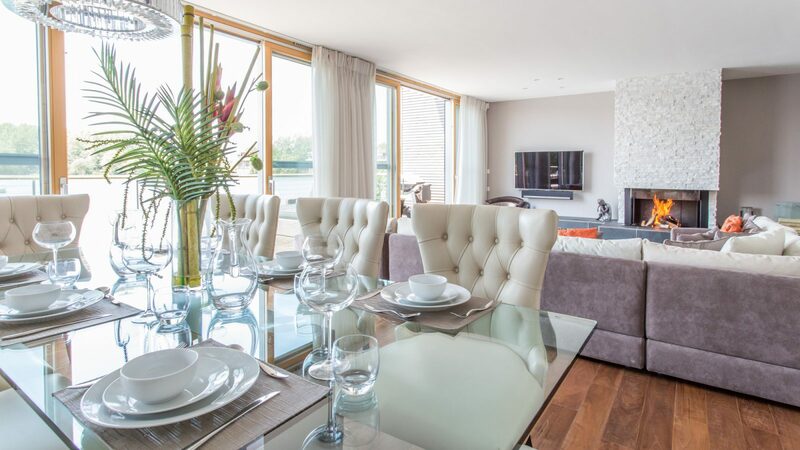 Lechlade Lodge is all timeless elegance: the designer dining table with its cream-leather chairs seats eight, there’s a Natuzzi alcantara corner sofa, and the kitchen is all NEFF, Miele and Dualit. 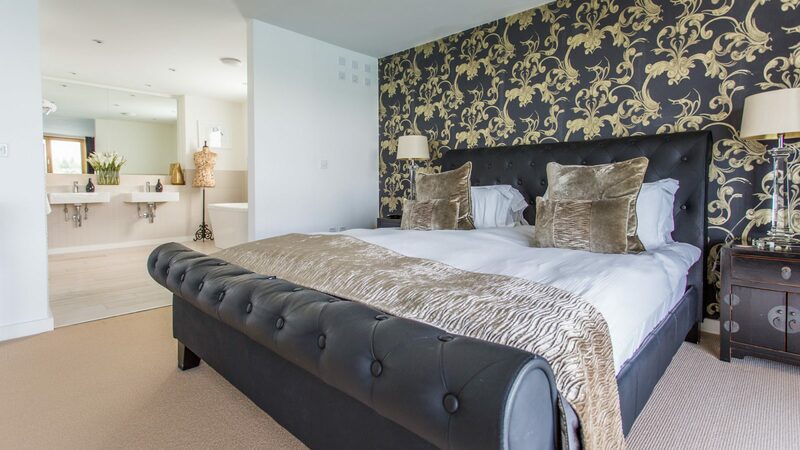 Three of the four bedrooms have en-suite bathrooms and TVs. Sleep deeply wrapped in premium cotton to the lulling sounds of the lakewater. Time spent here is an exercise in perfect silence, save for the happy chatter of your family and the pock of a surfacing trout. It’s an investment in your soul and your sanity. Your 16-metre deck looks out onto the lake – throw a line out and fish for your supper. You can smoke your catch at the Saturday Hook and Cook barbie. 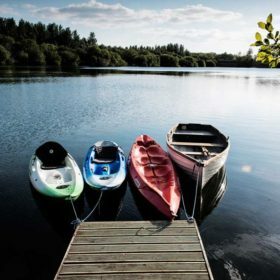 Swim in the lake, or paddle your kayak (provided) over to the clubhouse. We can think of worse things to do. When you paddle back, a barbie on the south-facing deck with the sun on your back is a sizzling idea in the sunshine. 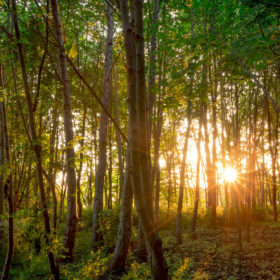 Beyond your private space at The Lakes, the eco-site rolls forever. 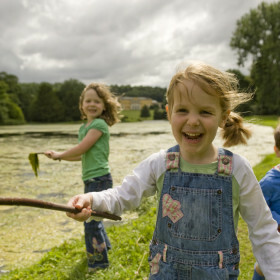 There’s a full 650 acres of Swallows and Amazons to explore by bike or on foot, while the kids keep busy in the tepees or on the trampoline, or discovering the School of Rock and Ben Fogle’s School of Wild. 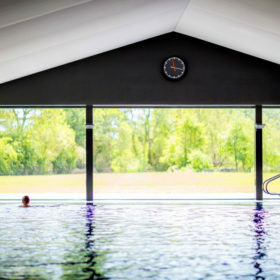 Paddle to the Orchard Spa, with its 17-metre heated pool, sauna, steam room and gym. 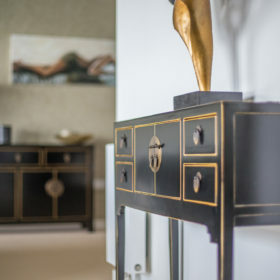 Feel the magic fingers in the treatment rooms, get pampered at the manicure bar, then chill and hang in the club room around the pool table, Sky TV and drinks service. 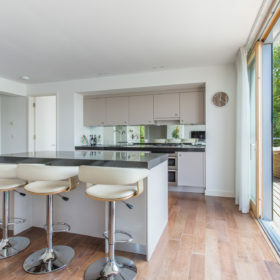 Beneath the futuristic flat roof and behind the expansive glass frontage, Lechlade Lodge’s living spaces have an inside-out feel. 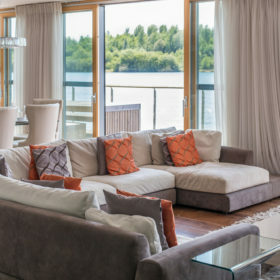 Slide back the doors and suddenly you’re on the deck of a boat, with the lake breezes gently circulating through the lodge. 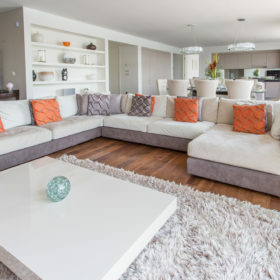 You’ll keep warm and cosy in the evenings around the log fire in the lounge, sprawling on the giant Natuzzi cream-and-taupe alcantara corner sofa in front of Sky TV or setting the soundtrack to your stay through the Sonos speakers. Lap up the sense of space and light as you stare at the flickering flames over a Nespresso. 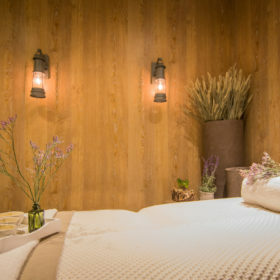 All around you, earthy tones and natural textures combine with soft neutrals to connect you with nature. 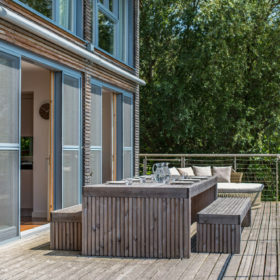 That’s even more apparent from the floor-to-ceiling windows, revealed as dense curtains glide soundlessly apart, through which you see nothing but reed beds, wild birds, woods and the sun shimmering on the water. These are spaces in which you put a hold on time, where everything happens in lazy slow motion, as you doze on the deck, pick a DVD, play evening card games around the logburner, or simply allow yourself to be hypnotised by the flickering flames or the constant gentle surfacing of the fish on Longdoles Lake. 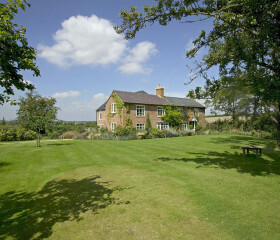 Cooking is a pleasure here, with the doors open to the deck and the open-plan kitchen-diner alive with household names. 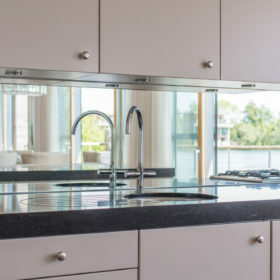 Put on your apron and get stuck in to the Miele fridge and freezer, NEFF cooker and dish-washer, Sanyo microwave, Nespresso machine, Dualit toaster and De Longhi kettle. But maybe you’d prefer a catered package. Any why not? Health is everything here. Maybe start the day with Yoo farm eggs, porridge dotted with berries or dates, beetroot, ginger and cucumber juice. Plus fresh bread from the local farm shop in Cirencester. Lunch and dinner are equally enticing – maybe a vegetarian chilli? A courgette and pepper salad? Or perhaps squash soup or kohlrabi and marinated mushrooms? Polish it all off with baklava and figs with bouja bouja ice-cream, all washed down with herbal tea. 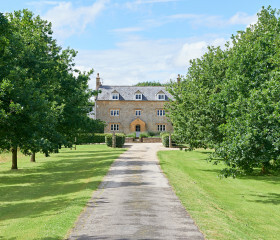 If you’re eating out, The Swan at Southrop comes with a recommendation from Ms MacPherson herself. Try Salcombe crab or garden bruschetta and radishes with soft-boiled quail eggs. 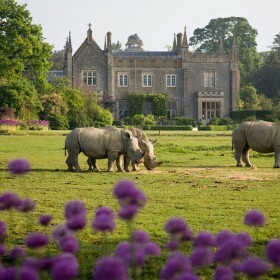 For that Michelin-starred experience, shine your shoes and try the Lords of the Manor’s lipsmacking tasting menu. 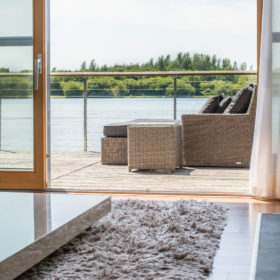 From your bed, the floor-to-ceiling windows offer a picture view of the sun glinting on the water. Inch them open to let in the lake breeze. Reed beds and wildfowl add to the vision of rural serenity. 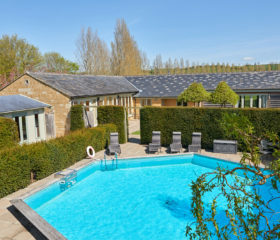 Lechlade Lodge sleeps eight in comfort and unabashed luxury. 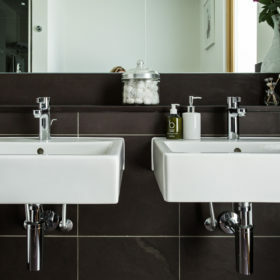 Three of the four bedrooms come with exquisite en-suite bathrooms and TVs, and the fourth offers access to a separate shower room. 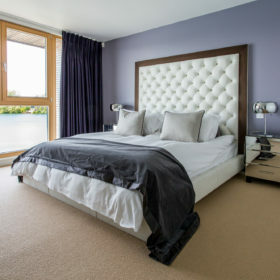 Premium cotton bed linen, duvets and bath towels come as standard. The master suite gives you a superking bed and pullout sofa-bed for two children. 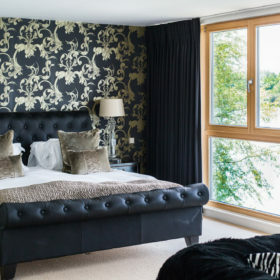 Bedrooms two and three offer kingsize beds, while bedroom four is a twin. 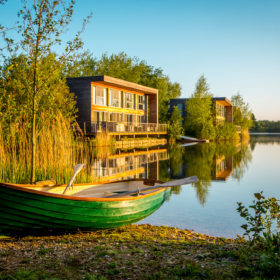 Whichever room you choose, you’ll be snoozing in seconds with the windows open to the muted sounds of the wild birds and the breezes that hush over the lake. Well, kids, will it be the Cotswold Wildlife Park for lemurs and lions, Birdland for parrots and pelicans, or a hawk walk around Cheltenham? Grown-up kids will enjoy pottering for England around tearooms, antique shops and bookshops, or Cheltenham for racing and retail.